At last, the day is here when I start cutting the JoAnn fabric (see right) and begin making my suit! I got the fabric from the US through the kind help of Bob Mitsch, who managed to track down the last few remnants of the fabric on behalf of a number of cosplayers. Thanks Bob! Looking back a few months I would have been terrified to start cutting the trousers, but now I feel I have gained enough experience and knowledge to do them with confidence. 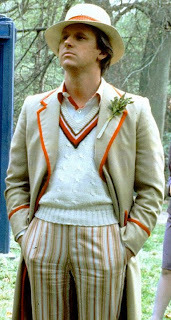 I am doing the trousers based on the lifted pattern from the GAP trousers, and plan to follow this as close as possible. I bought a pair which were the same cut as the screen used trousers and are a perfect fit for me (see right). This means I don’t need to adapt or change the pattern, aside from a couple of real minor tweaks. I carefully took the trousers apart, making a few notes as I went. I only took apart the unique pieces, such as the fly; one front pocket; one front and back and the waistband. I kept one front pocket and one back pocket fully intact as reference. I then made a paper pattern from the fabric pieces (see left). Now I have got my Five Trouser pattern sorted out, with its high conjoined waistband, I can set about making the real thing. 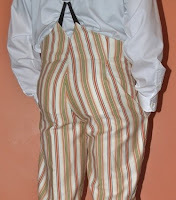 I ordered two yards of the Spoonflower printed fabric, and I quickly discovered that it was only just enough to make the trousers. I want to get the fall of the stripes just right, so I found some decent reference pictures and had them on hand while I was cutting the cloth (see below). 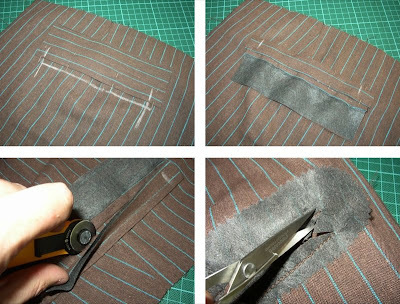 This particular picture (see left) was helpful in working out the scale, as I could count the stripes between pocket edges and work it so they would fit to the width of the trousers I was planning to make. For the fronts I noticed how the wider stripe cluster runs up the front fly, so I position the pattern so it falls in the appropriate place. Once I have cut one side from the pattern, I then turn the cut piece over and line it up to the stripes below. 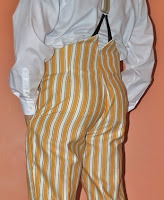 I can then cut a perfect mirror copy to make sure the trousers are symmetrical (see below). The only downside of ensuring the stripes fall correctly is that you cannot cut the pieces as economically as you would like, and even the excessive areas of selvage are not as usable as I would like because again the smaller pieces still need to fall correctly on the stripes. As a result I found I needed every inch of the two yards I had ordered – it cannot be done in one yard!